In a word, slowly. Living, as we do, a couple of kilometres down a country lane from a main(ish) road, we have become accustomed to the potential hazards of driving in rural Mallorca. It must be said – with the greatest of respect to Mallorcan drivers – that anticipation of the possible dangers that lurk, for users of country lanes, is sometimes lacking. Road surfaces on Mallorca are generally very good. It was something we – and our visitors from England – often commented on in our early days of living on the island; even though our lane, at the time, was just a string of potholes linked together with bits of ancient asphalt. But even with a good road surface, driving in the country can present some challenges – particularly in lanes that are too narrow for cars to pass each other easily when travelling in opposite directions. Once, a neighbour’s son (a budding Fernando Alonso) missed our car by just a few centimetres because he’d been driving too fast from the opposite direction. 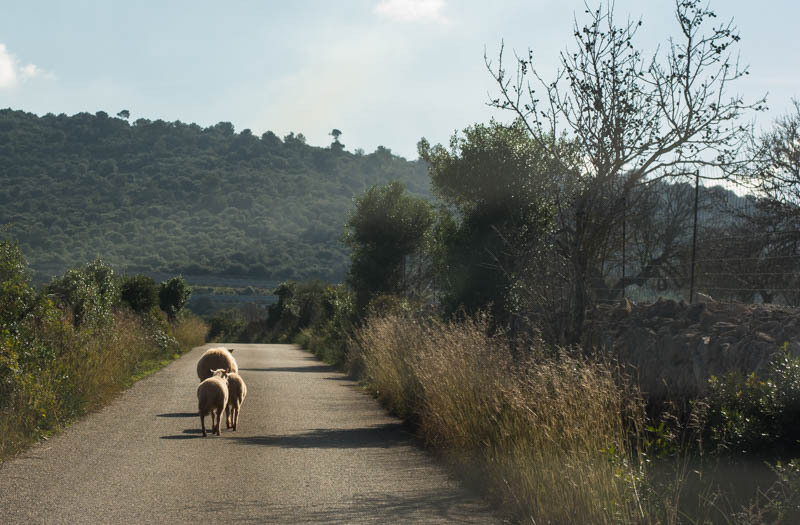 Cyclists love Mallorca’s rural lanes. 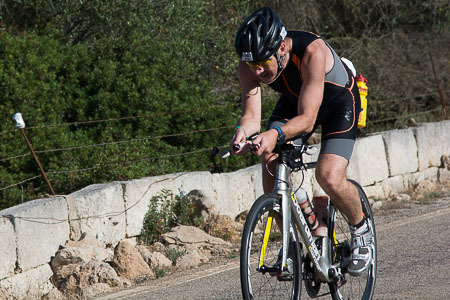 Mallorca is a magnet for keen cyclists and, during these cooler months of the year, many professional and amateur club cycling teams come here to take advantage of some excellent cycling conditions. If you’re driving, there’s every chance that you’ll find yourself crawling behind a Lycra-clad peloton. Or facing an oncoming one in a narrow country lane. Given the speed these bikes can travel, it doesn’t pay to be driving too fast. Our valley was full of rabbits when we first moved here and, what with the potholes and Bugs Bunny’s numerous friends, driving down our lane (particularly after dark) sometimes called for lightning reactions. The buck-toothed population has diminished in recent years (myxomatosis contributed to this), but rabbits do still suddenly shoot out onto the tarmac from the verges. As do their larger cousins, hares. The Mediterranean tortoise is another creature you could encounter on your travels. They will often just retreat inside their shells when a vehicle approaches, so careful driving is needed to avoid squashing them. These rather inelegant birds give out a distinctive cry and we regularly hear their spooky shrieks at night as they fly over. After dark they also have a tendency just to stand around. Sometimes, even in the middle of the road. On one occasion, we had to brake hard to avoid hitting one that we’d been sure would take off as we approached. It just stood there looking defiantly at us until one of us got out of the car and approached it on foot. After a period of decent rain, there’s yet another potential hazard. Mallorcan country folk (often women; often wearing polyester pinafores) wander along the sides of the lanes, bent double and collecting the snails that have been lured out by the damp conditions. Watch out for foragers – for snails and, in season, wild asparagus – particularly as you drive around bends, as they may not be visible below the level of the stone walls. Seemingly abandoned unfamiliar vans or small cars along a country lane may be an early warning sign of foragers who have driven out from a town or village for some of nature’s bounty. Beware of sheep (and goats) jumping from the tops of stone walls. 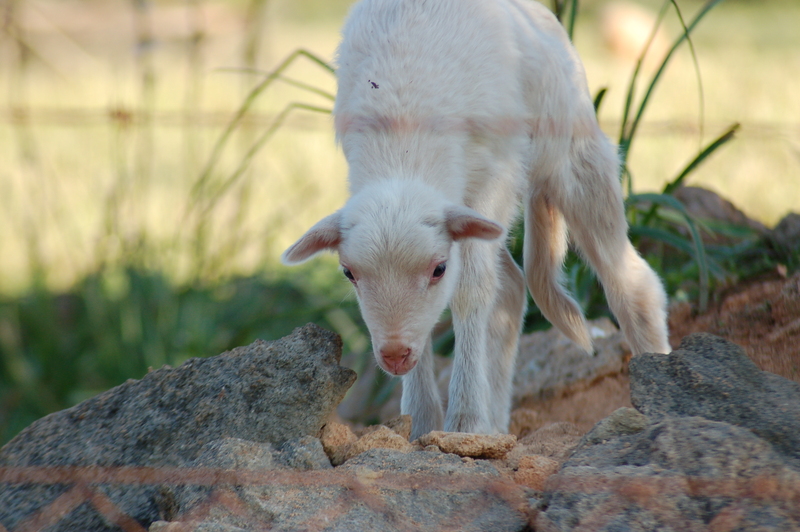 Sheep have a tendency to escape, because of their remarkable aptitude for climbing over dry stone walls. These woolly Houdinis can be a real danger if you come across them while driving too fast. And, take it from me, it’s almost impossible to shoo them back to where they came from. Another possibility is that you’ll encounter a shepherd moving his entire flock from one field along the lane to another field. There is no hurrying these beasts. 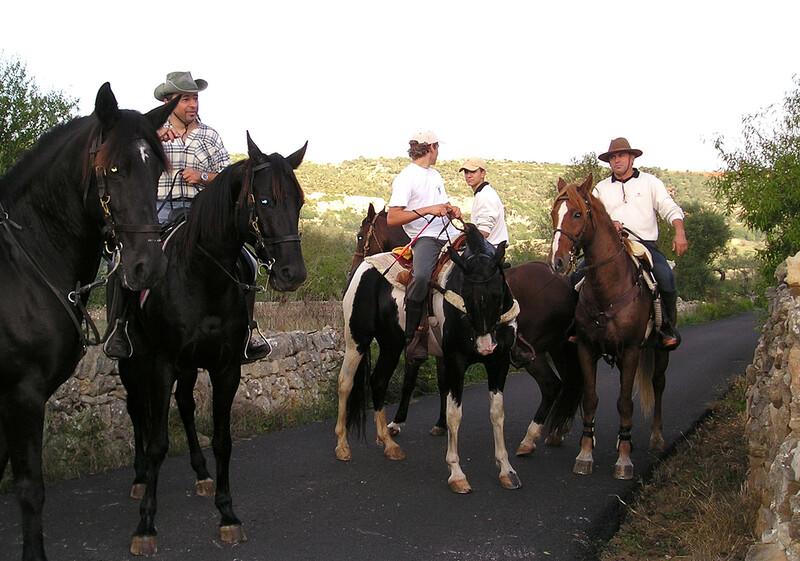 In our valley we often see individual riders and also groups of people out with their horses. Occasionally you see a trotting horse – complete with trotting carriage – out for some exercise. The above are all commonplace. Some of the more unusual hazards we’ve seen in our lanes have included a team of brightly dressed speed skaters (speed skating up the hill, no less), two donkeys that had escaped from their field and gone walkabout, and a couple of piglets that escaped from the truck transporting them from a nearby farm to their unfortunate destiny. Oh, how we cheered those two little pigs on in their Great Escape attempt … which sadly failed. Motoring on Mallorca can be a really pleasurable experience: traffic is a lot lighter than in the UK, for example, and the island’s scenery and distant views are beautiful. But don’t spend too long gazing at the views if you’re driving … you never know what may be ahead!